I’m both happy and sad that it’s Monday. It was a somewhat stressful weekend, so I have to admit that I’m glad it’s over. But on the other hand, it’s now back to the work week. It’s a catch-22, I’m telling you! In any case, last night we went over to my dear friend Faith’s new house that she is renting with her boyfriend. They barbecued for us, and all of us ate entirely too much. You might remember Faith from the time her and her boyfriend came over and I made meatloaf cupcakes with mashed potato frosting. This general tso’s chicken from The Spiffy Cookie’s blog is a valiant, but failed, effort. If you click the link to view the original recipe, it looks nothing like my own final product. The thing is, chicken prepared in the slow cooker shreds. It is a natural thing. For some reason, hers did not shred, looks crispy and crunchy, whereas mine shredded before I could even get them out of the cooker in order to cut them into chunks. 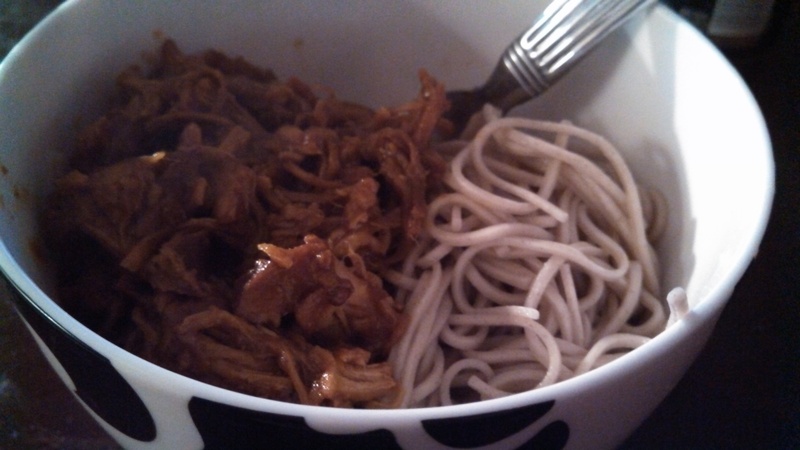 That being said, it was more of an Asian-inspired pulled chicken. I paired it with Japanese soba noodles, because we didn’t want to wait 40 minutes for the rice to cook, and soba noodles cook in 5 or less. It was still good, but I’m not sure if I would make it again. I was definitely in the mood for some good “fake out take out” (I hate, hate, hate that phrase, by the way), and this did not do the trick, sadly. That being said, if you decide to make this for yourself, please let me know how yours turned out! -Spray crockpot with cooking spray and add chicken. -In a separate bowl, whisk together water, hoisin sauce, soy sauce, brown sugar, ketchup, ginger, and crushed red pepper, then pour sauce over chicken. -Cook for 4-6 hours on low. Remove chicken and cut into chunks (or shred, in my case). -Turn crockpot up to high and whisk cornstarch into the sauce to thicken it up; cook on high for 15 minutes. If it isn’t quite to desired thickness, slowly add more cornstarch teaspoon by teaspoon (I didn’t have to add more). -Add chicken back to the crockpot and allow to heat through for a couple minutes. -Serve with desired side dish and garnish. Sorry to hear yours didn’t come out well! Slow cookers vary a lot I have noticed. Thank you! It was still good (like I said, Asian-inspired), hehe, but just not the general tso’s feel I was looking for. Do you use a special technique?